Raleigh will add yet another hip cafe to its booming downtown this September on the corner of Martin and Wilmington streets. But unlike most foodie hot-spots in the middle of the capital’s downtown, this is one that — no matter how popular it becomes — never will turn a profit. And that’s exactly the point, say founders Jim Freeze and Vicky Ismail, two philanthropic entrepreneurs who aim to help homeless, struggling women get back on their feet through work and professional training. Carroll’s Kitchen, a grab-and-go deli that will offer artisan soups, sandwiches, breads, and pastries to busy downtowners, is a nonprofit providing jobs and housing to single women who are living in shelters, recovering after spending time in prison, or looking for a way up from similar hardships, Ismail said. Ismail, a long-time restaurateur and the current owner of Highgrove Estate in Fuquay-Varina, said the idea sprouted two years ago when she read a magazine article about King’s Kitchen, a Charlotte nonprofit with a comparable business model. “It was really exciting to me knowing that there was another accomplished restaurant that was able to pull this off along with some other businesses, so it was kind of a dream that would be a cool thing to do,” Ismail said. Ismail said her experiences volunteering at Vintage Church and working with Raleigh’s homeless population helped her realize the existence of a gap in services for single women in need of professional training. When she pitched the idea of a nonprofit startup to Jim Freeze, Vintage Church’s former full-time building manager and coordinator of ministries with the Raleigh Rescue Mission, he was thrilled. The two teamed up to launch their nonprofit, founding it in a building named after the now-deceased Raleigh businessman and philanthropist Ernest Carroll. When it became clear that CK’s would need a full-time, executive director to get business off the ground, Freeze quit his job to take on the new role. That was one year ago. Today, as Freeze, Ismail and a handful of other team members work to finish painting and refurbishing their new rental space on 19 East Martin Street, they’re now more convinced than ever that this restaurant has the potential to offer better solutions to serve Raleigh’s homeless, Freeze said. Community support has been overwhelming, with local restaurants holding fundraisers, and other professionals offering their time and services to help get the restaurant off the ground, Freeze continued. CK’s will cater specifically to single women who are looking for a way out of homeless shelters, Freeze added, citing that group as one of the fastest growing and most underserved in Raleigh. In addition to guaranteeing employment, the nonprofit will provide housing for its employees in partnership with Families Together, a charitable housing organization also based in Raleigh, Freeze said. Other nonprofits that will assist CK with staffing and training needs include Step-Up Ministries, the Wake County Salvation Army, and the Raleigh Rescue Mission. This combination of employment and shelter is what makes CK a unique and necessary experiment, said Sandy Stewart, director of women’s ministries at the Raleigh Rescue Mission. Stewart, who so far has helped to place one woman in employment with CK, said she hopes the restaurant’s model of charitable entrepreneurship will continue to catch on across the city. Much of that encouragement will come from Nina Sigarto and Liz Reedy, CK’s general manager and chef, respectively, who will help the restaurant’s employees to become skilled, independent workers. 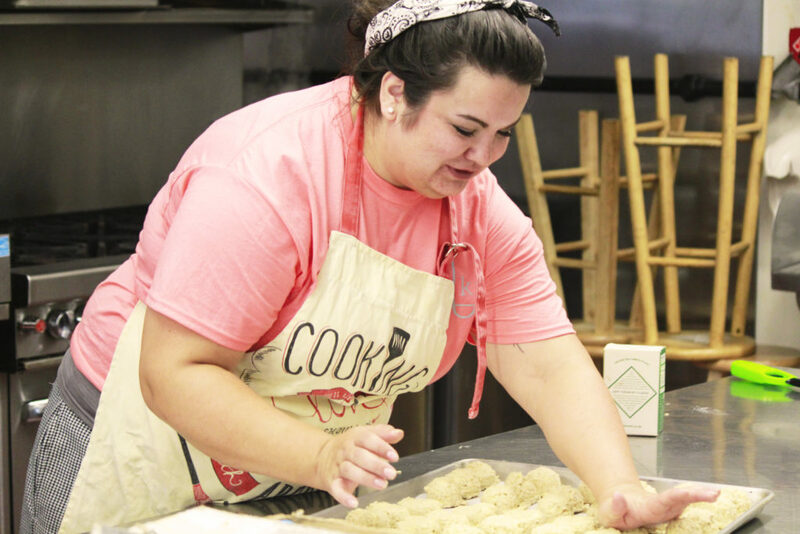 Reedy, who loves bringing joy to others through her cooking, says that her goal is to craft delicious, locally sourced foods that keep customers coming back — while also helping employees gain chops in the kitchen. The goal is not just to provide jobs, but to help these ladies move on with their lives and find new purpose, Sigarto added. CK’s commitment to empower women over the long term could inspire a taste for more projects with similar goals, Stewart said. “The need is great, and I believe that investing in people’s lives is very rewarding, but it is also helping individuals become self-sufficient, and to move forward in life,” she concluded. Click here to help CK by donating to its Kickstarter campaign.